This Garlic Butter Baked Salmon is an ultra-easy and a flavourful dinner to make during your busy weeknights! Oven to table in less than 30 minutes – you can even serve it directly in the foil! In a bowl, add in garlic, parsley, lemon juice, lemon zest and melted butter and mix it all together. Roll out a big piece of aluminium foil big enough to wrap the salmon nicely and place the salmon fillet in the center. Season the salmon with salt and pepper. Pour the mixture made in step 2 above the salmon fillet. Fold up all 4 sides of the foil and make sure nothing spills. Bake the salmon at 200C for 15 minutes. 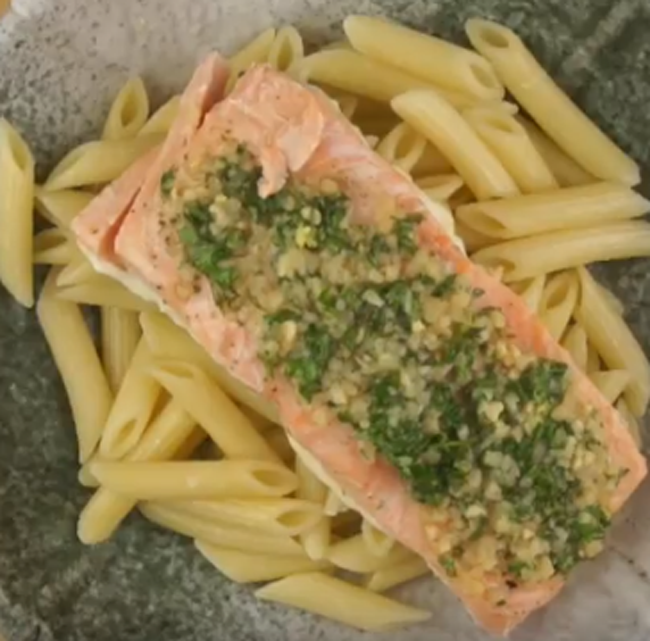 Serve the salmon with cooked pasta.